All events will be run in accordance to the 33rd Edition Surf Sports Manual and all current circulars and bulletins issued by Surf Life Saving Australia and Life Saving Victoria. A copy of the manual can be purchased via our online shop at www.lifesavingvictoria.com.au or downloaded from the SLSA website www.slsa.com.au. The ultimate individual challenge in surf sports are the Ironman and Ironwoman. In Opens and U19s, competitors complete a swim, board and ski leg, and a transitional run leg, in a random order drawn at the start of the carnival (this order is kept for Taplin Relays, which are mentioned below). Younger age groups do not contest the ski leg. The Open Taplin Relay two competitors in each discipline completing the course in the same order as the Ironman. Open Female Taplin and U19 Taplins have only one competitor in each Discipline. The Cameron Relay is contested in the U15s and U17s. The Cameron Relay consists of board, swim and run legs. The Lifesaver Relay involves a swim, board, ski and run leg, plus a surf boat leg. Teams must comprise at least one female and one U19 competitor. In the Board Rescue, a swimmer makes their way out to a string of buoys, and upon reaching their individual mark, raises their hand to signal their board paddler, or ‘rescuer’. The paddler then heads out, picking up the ‘patient’, before they both paddle to shore and cross the line, with both athletes holding the board. The Surf Race is a swimming event that starts on the beach and sees competitors round a string of marker buoys or ‘cans’ before returning to the beach and finishing with a sprint to the line. Teams of four from each club contest the Surf Teams, with the accumulated score of each member of the team determining the winner. The Board Race starts on the beach and sees competitors paddle their boards around a string of marker buoys or ‘cans’ before returning to the beach and finishing with a sprint to the line. Competitors must complete the run to the line carrying their board. The Board Race is longer than the Surf Race. The Board Relay involves teams of three, however unlike the board race, the finish and transitional legs do not require athletes to carry their boards. The Ski sees competitors in a standing water start before paddling their ski around a string of marker buoys or ‘cans’ before returning to shore where they cross a plane between two flags to finish. The Ski Race is longer than the Surf and Board Races. The Ski Relay involves teams of three with the finish and transitional legs completed as a run.In the Open and U19 age groups there is a Double Ski event, with two athletes in each craft, while the Opens also contest a Mixed Double Ski with a competitor of each gender in the craft. The Beach Sprint is perhaps the most simple of all events for it is a matter of getting to the end of a sand track faster than the next competitor. The Beach Relay is for teams of four runners who transfer a baton after each completing one leg of the Beach Sprint course. In Flags, competitors lie face down on the sand with their feet closest to the pieces of rubber hose, or ‘flags’, positioned in the sand a short sprint away. Once the starting whistle is blown competitors must rise to their feet, turn to face the flags and then ensure they are able to capture a flag. There will be one flag less than there is competitors, thus ensuring one competitor is eliminated each round until a winner is decided. A surf boat crew consists of four rowers and a sweep. The rowers sit on alternate sides of the boat and each pull one oar with two arms while the sweep stands at the back of the boat and steers. Each crew starts on the water’s edge and rows out around their designated turning ‘can’ before proceeding back to the beach through a set of ‘gate cans’. Not only is each crew trying to win the race but they must ensure they stay upright. Capsizing means immediate disqualification and often a heartbreaking end to month’s and month’s of hard work. Crews compete over a series of rounds, earning points to qualify for repechages, quarters, semis and the final. There are U23 Male and U23 Female, Open Male & Female, Reserve Grade and U19 categories. The R&R competition is one of the more traditional events at a surf carnival. It involves two, five or six person teams performing a simulated rescue drill that is judged on the precision of each team’s actions. Depth of each team is tested, with each squad randomly drawing which element of the R&R they will have to perform. The R&R was once the most coveted prize at Championship events, and still uses the traditional belt and reel. Surf Belt races for U19 and Open competitors are performed using the reel, line and belt. They are made up of five man teams – a belt swimmer, three linesmen and a reelman. The gun start signals the teams to run from the shore line to pick up their reel with the swimmer, or ‘beltman’, jumping into the belt and the reel party carries the reel down the beach. The beltmen are assigned individual buoys and signal their arrival raising one arm above their head after touching their buoy. There are rescue tube events for senior competitors, where a swimmer will, similar to a belt race, place his or her arm through the shoulder strap of the tube and swim to their designated buoys and raise his or her hand. The Rescue Tube Rescue in the U19s and Opens are four person events whereby a ‘patient’ is dropped behind the designated buoy and the rescuer swims out with fins on to help with their speed, and places the tube around the patient. The rescuer then tows the patient back to shore, where he/she hands over to a team of two who carry the patient across the finish line and the event is complete when the pair crosses the start/finish line. The younger age groups contest a Rescue Tube race, whereby the tube swimmer swims with tube in tow to a designated can, and raises their hand to complete the race. All events will be run in accordance to the Royal Lifesaving Society Australia competition handbook which can be obtained from the Royal Life Saving Society website at www.royallifesaving.com.au. The competitor swims 25m freestyle and then dives to recover a submerged manikin to the surface within 5m of the pick-up line. The competitor then carries the manikin to the finish edge of the pool. The competitor swims 50m freestyle to turn, dive and swim underwater to a submerged manikin located at 20m distance for men and 15m distance for women. The competitor surfaces the manikin within 5m of the pick-up line and then carries it the remaining distance to the finish edge of the pool. The competitor swims freestyle wearing fins and then dives to recover a submerged manikin to the surface with 10m of the turning edge. The competitor carries the manikin to the finish edge of the pool. The competitor swims 50m freestyle with fins and rescue tube. After touching the turning edge, the competitor fixes the rescue tube around a manikin floating at the surface at the edge and tows it to the finish. The competitor swims freestyle and then dives to recover a submerged manikin. The competitor surfaces the manikin within 5m of the pick-up line and carries it to the turning edge. After touching the wall the competitor releases the manikin, in the water the competitor dons fins and rescue tube within 5m of the turning and swims freestyle. After touching the wall the competitor fixes the rescue tube around a floating manikin within 5m of the turning edge and tows it to touch the finish edge of the pool. In this timed event, the competitor throws an unweighted line to a fellow team member located in the water approximately 12m distant and pulls the ‘victim’ back to the poolside. Manikin Relay four competitors in turn carry a manikin approximately 25m each. Obstacle Relay four competitors swims freestyle each passing under two obstacles. swims freestyle with fins. The third competitor swims freestyle pulling a rescue tube and after having touched the wall, passes the harness of the rescue tube to a fourth competitor who wears fins. The third competitor, playing the role of ‘victim’, holds the rescue tube with both hands while being towed by the fourth competitor to the finish. The Simulated Emergency Response Competition tests the initiative, judgment, knowledge and abilities of four lifesavers who, acting as a team, apply lifesaving skills in a simulated emergency situation unknown to them prior to the start. This competition is judged within a 2 minute time limit. All events will be run in accordance to the 32nd Edition Surf Sports Manual and all current circulars and bulletins issued by Surf Life Saving Australia and Life Saving Victoria. A copy of the manual can be purchased via our online shop at www.lifesavingvictoria.com.au or downloaded from the SLSA website www.slsa.com.au. 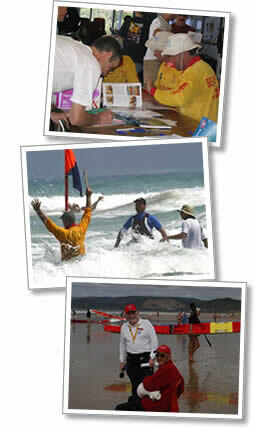 Added to these rules are the IRB competition specific rules which can be downloaded at www.lifesavingvictoria.com.au. Driver and crewperson approach a turning buoy, at which point the crewperson enters the water with a rescue tube attached and swims towards the patient located at another buoy. After securing the patient with the tube, the crewperson tows the patient back to the IRB. Once the patient and crewperson are back in the IRB, the driver heads back to shore to finish. Driver and crewperson approach two patients in the water, picking up one and returning to shore. The patient exits the boat and the driver rounds a turning point on the beach while the crewperson turns the IRB. The driver restarts the IRB and again proceeds to collect the second patient. The IRB then returns to shore to finish. Driver and crewperson approach two patients in the water, picking up one and returning to shore. The patient and driver exit the boat while the crewperson turns the IRB. A second crewperson makes their way to assist turning the IRB, while the first driver tags the second driver. The second crew makes their way out to rescue the second patient and return to shore to finish. This is the simplest discipline, with the driver and crew heading out to collect a single patient then returning to shore as quickly as possible.